Experience the 19th century elegance of our four dinning rooms, which have been beautifully restored to make you feel like you're going back in time. 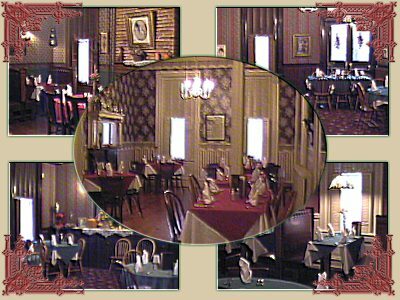 Our dinning rooms can accommodate just about any occasion, all business meetings, rehearsal dinners, weddings, birthday parties, and any special event. The chef prepares daily lunch and dinner features, and uses the freshest ingredients possible. If you're lucky you may even catch a glimpse of our ghost!!! So think of U.S. for your next night out!